The 90’s are notorious for having some of the most popular inserts, parallels, autographs, and relics. Collectors are constantly looking for those rare gems to add to their collection. Some can be worth a few dollars, while others can reach triple digits. Its insane to see the level of popularity many of these cards have reached. In 1999, relic cards had only been around for two or three years. It was still considered a big deal to pull a game-used card, even though it might have been of a nobody and limited to a thousand copies. If you pulled something like that today, it would most likely fall to the bottom of a bargain bin. 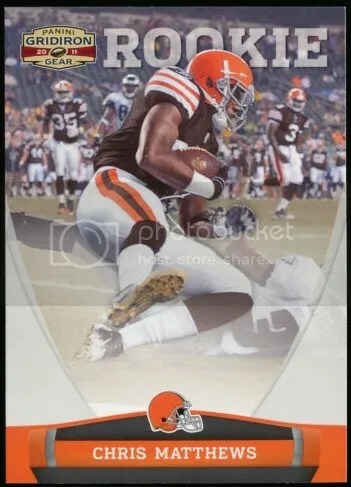 Among all the parallels and inserts found within packs of 1999 Leaf Certified, what many collectors kept their eyes open for were the Gridiron Gear jersey pieces. Every one of the Gridiron Gear relics were serial numbered to 300. It didn’t matter if the piece was a plain colored jersey or a multi-colored patch. It was stamped out of 300 on the back. Now those NFL logo patches. They’re a little different. Even though these NFL logo patches look like something that could be pulled from a pack of 1999 Leaf Certified. That simply is not the case. They’re designed like the others, but you could open every single box that Donruss/Playoff made and you’d never find one. These were made after Leaf Certified was released for a special charity auction. There are 72 total cards each numbered 1/1. Why they included Thurman Thomas and Emmitt Smith in this set is a mystery, because those two do not have NFL logo patches. The Thomas and Smith cards just have regular looking patches that can easily blend in with the versions numbered to 300 that came out of the packs. This set has changed hands a few times over the years. Dave & Adams Card World were the original owners. Since then it has been bought and sold as a complete set numerous times. The last person to own them decided to sell the cards individually. From time to time you’ll see one of these cards surface. Prices for each card can vary based on the player. For a handful of players, this is the only NFL logo patch card ever made. I believe the last time the complete set sold was for around $5,000.00. That doesn’t seem too high of a price for all 72 cards. Maybe because these were after market production promos. 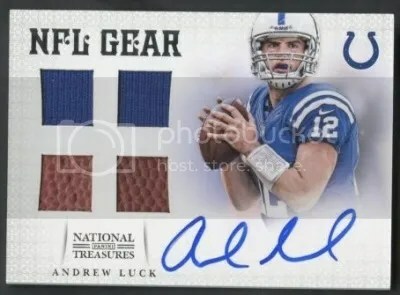 Despite being 1/1 NFL logo patches, some collectors only want the stuff from packs. 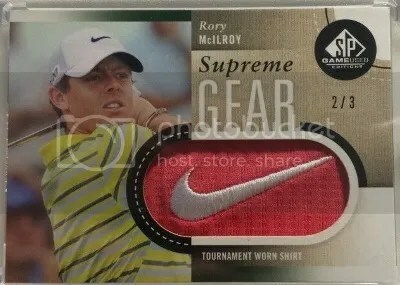 There is also a rumor that some of the patches were fake even though they came with an LOA from Donruss/Playoff. Its one of those crazy oddball sets. 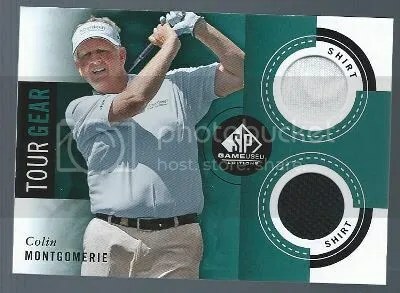 Congrats to Zac Smith on being the lucky winner of the Colin Montgomerie 2014 UD SP Game Used Edition Tour Gear Dual Shirt Relic. 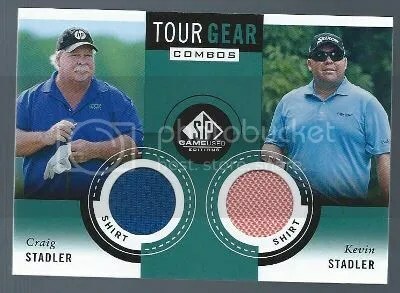 Once Zac Smith sends me his mailing address, I will ship this card ASAP. Thanks!